Cpl. Sidney Walton wants to give others a chance to meet him, if they'd like. Cpl. Sidney Walton celebrated his birthday surrounded by family, friends and some folks who just wanted to tell him "thank you." It was a rather big birthday to celebrate: On Monday, Walton, a World War II veteran, turned 100. He told ABC News he'd like to see "another 100 years" go by. Walton was 21 when enlisted in the U.S. Army on March 4, 1941, nine months before Pearl Harbor, to fight in the war. 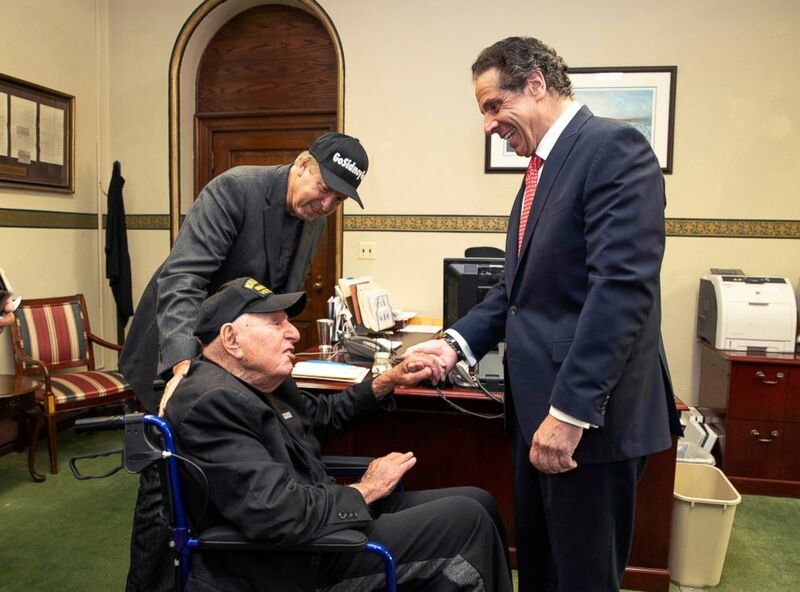 (Mike Groll/Office of Governor Andrew M. Cuomo via AP) Governor Andrew M. Cuomo, right, shakes hands with World War II veteran Sidney Walton at the Capitol in Albany, N.Y., May 18, 2018. The 99-year-old World War II veteran who regretted skipping the chance to meet some of the nation's last Civil War veterans in 1940 is on a mission to visit all 50 states so people who've never met a WWII vet can finally meet one. Standing at left is Walton's son, Paul Walton. Walton, who served in the 34th infantry, 8th division, told ABC News that Adolf Hitler "represented the worst elements of humanity in my mind." After the war, he returned home and raised a family. As the years went by, however, he shared one regret in life with his family: that he'd not met any Civil War veterans when he'd had the chance. So, with his 100th birthday approaching, he and his family got an idea: to visit the 50 U.S. states in hopes that Americans might want to meet him, a World War II veteran. 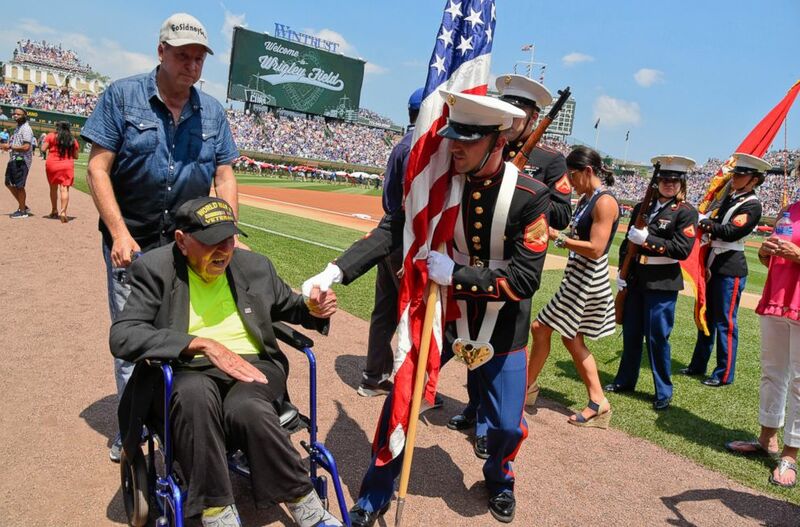 (Matt Marton/AP) World War II veteran Sidney Walton, left, is greeted by a member of the color guard before a baseball game between the Chicago Cubs and Detroit Tigers, July 4, 2018, in Chicago. Walton has been to 19 states so far. On Monday, he came to New York, where he was born on the Lower East Side a century ago. Walton was raised in Brooklyn before moving to the South Bronx. The New York City Department of Veterans' Services held a birthday party for him and military veterans gathered to wish him another 100 years and to thank him for his service. "It's really a great honor to be able to shake someone's hand like his," said U.S. Navy veteran Jason Loughran, who served in Afghanistan. 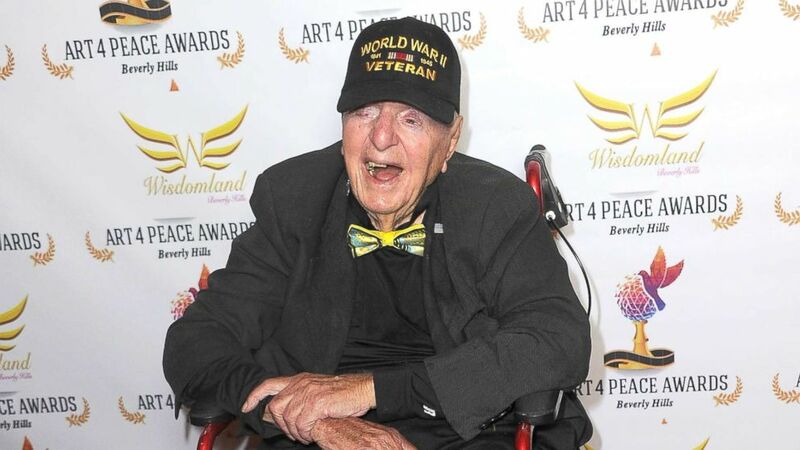 (Albert L. Ortega/Getty Images) WWII Veteran Sidney Walton attends the 3rd Annual Art 4 Peace Awards 2018, Oct. 28, 2018, in Beverly Hills, Calif. Veteran U.S. Navy Senior Chief Petty Officer Lamarr Wheeler told ABC News that he was glad he'd had the opportunity to meet Walton. "He means everything. ... They're very few World War II veterans left," Wheeler said. "This is an outstanding day. I mean, to have a man of Sydney's caliber. ... We stood on his shoulders. ... It's an honor," said veteran Tommie Lloyd, a U.S. Army specialist. Click here to track Sidney Walton's progress.